I feel like I should forewarn you – I am the queen of TMI. I prefer transparency and keeping it real. I also feel like there is no way to cover the next few stages of my post-mastectomy recovery without TMI. Things are about to get very real. So, consider yourself warned. 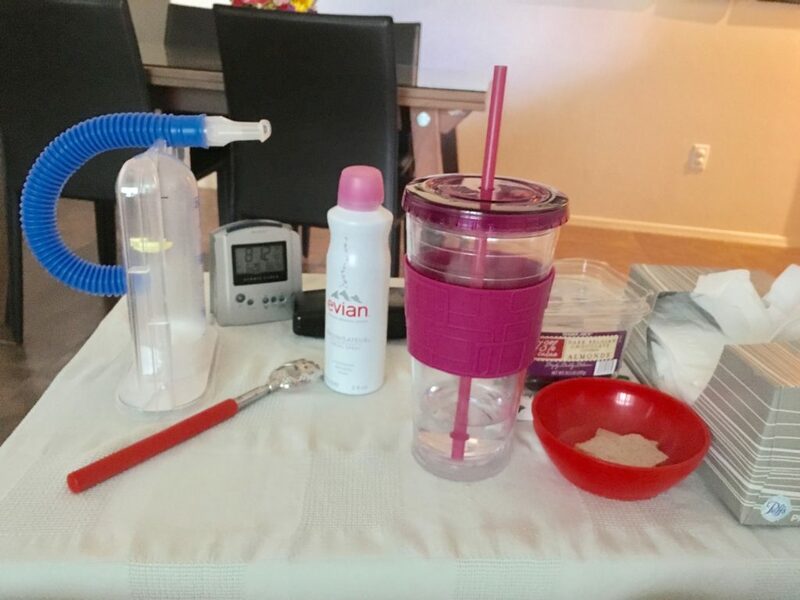 Leaving the hospital meant navigating the post-mastectomy recovery process on our own at home. I no longer had the attention or input of medical professionals at the push of a call button. I wish I could tell you everything was smooth sailing from then on out, but it was not. The intense pain I felt at the hospital continued without relief despite taking narcotics as prescribed by my surgeon. My husband managed my small pharmacy of post-mastectomy drugs with great care and attention. He was on top of my medications 24/7. 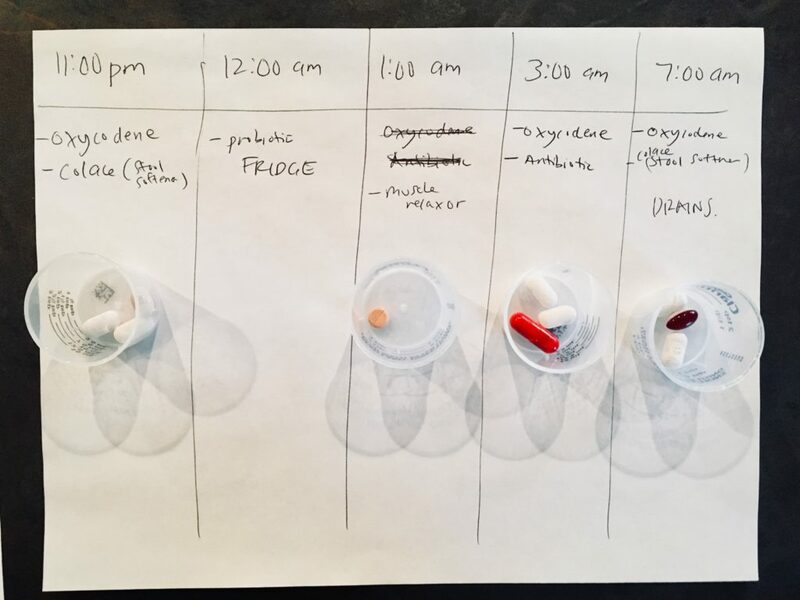 He charted and portioned out my medications for each day. He designated the times they were to be taken and even set alarms to ensure we didn’t inadvertently miss a dosage. I honestly think my husband deserves a “Husband of the Year” award. I know most everyone says “in sickness and in health” when they recite their wedding vows, but it’s not a reality until you get to that “in sickness” season. My husband went above and beyond in this season. He has always been amazing and super supportive, but post-mastectomy he zealously took on the role of home healthcare provider/coordinator. At home, I took up residence in a recliner I borrowed from my grandmother-in-law. With a nightstand by my side filled with necessities, I spent most of my days and nights in that chair. Not as comfortable as the hospital bed, but the closest I could get at home. I slept in that recliner for literally months. Our modern bedframe was too low to the floor to make an easy transition from lying to standing. Plus, lying flat proved too painful. I was most comfortable in a slightly reclined position. My “essentials” on my nightstand next to my recliner. Although I couldn’t operate it by myself for months, the reclining motion of the chair was paramount. I was incapable of transitioning from reclining to sitting without help. Even with help, it was precarious and painful. The automatic motion of the chair eased this transition. I still required someone to operate the chair for me and then physically lift me to make the transition from reclining to standing. Since I slept in the recliner, my husband took up residency on the couch so he could sleep beside me. Restful nights alluded me as I struggled with sharp pains, no doubt the repercussions of the trauma to my chest, nerve damage and nerve regrowth. Aside from being heavily medicated and not feeling like myself, I was exhausted all the time from lack of quality sleep. I spent my days and nights in and out of sleep. The pain and discomfort were the most I had ever endured. I know this is relative based upon prior experiences with pain. The pain and discomfort were comparable in intensity to childbirth (I gave birth to all three of my children naturally). However, unlike childbirth, the end was not in sight. Childbirth was intense, but luckily it lasted less than a day. My post-mastectomy pain and discomfort continued at that same level of intensity for days without any relief in sight. There were no benchmarks or indicators the pain would soon subside. I longed for the predictability and relief of labor and delivery. Some days I wanted to curl up in a ball and cry, but let’s be honest, I could not have done that even if I tried. 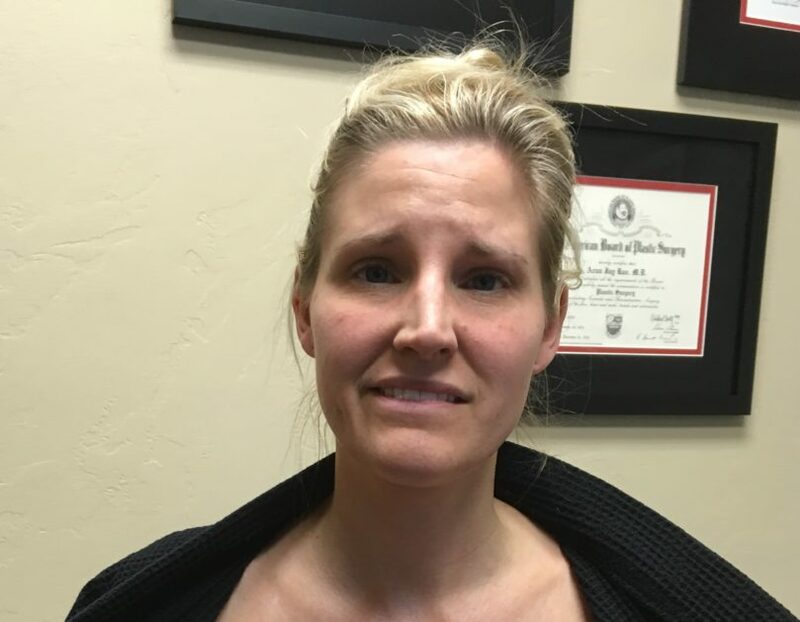 Not only did I feel pain and discomfort from the mastectomy itself, but I also began to experience pain and discomfort from the narcotics. A common side effect of narcotics is constipation. To offset this, I had been prescribed stool softeners. Despite this, I experienced constipation to an extreme. My diet had advance to normal foods, but nothing was moving through my system. My stomach bloated. This only added to my pain and discomfort. My post-mastectomy discharge instructions required a post-surgery call to the surgeon if a bowel movement did not occur after two days. Two days came and went. I called my surgeon’s office. Thus began my journey through every possible option for relief. First, she suggested a more natural option – a diuretic cocktail that consisted of prune juice, apple juice and melted butter – seriously! I drank this regularly for two days without relief. Then I was instructed to try MiraLAX followed by Milk of Magnesia. None of these provided relief. That is how I found myself on the phone with a friend four days post-mastectomy having a conversation I never dreamt of having. You see the next option was an enema. I know TMI. I warned you. My husband went to the store and bought an enema. We were standing in the bathroom as he read the directions and declared – “I think I can do it.” That’s when I called a time-out. No doubt he could try to do it, but I decided to enlist the help of a professional. I picked up the phone and asked my friend who is a home health care nurse to do something I never imagined I would ever ask a friend – could she come over and give me an enema? I told you it was about to get very real. I am convinced it takes a special kind of person to be a nurse. Not only did my friend agree to do it, she was happy to help. I wish I could say it worked, but it didn’t. I called my surgeon’s office again and I was instructed to drink what a friend of mine aptly refers to as “liquid dynamite” – an entire bottle of Magnesium Citrate. It tasted disgusting and made me throw up, but it brought much needed relief…unfortunately to the opposite extreme. With incredibly limited mobility I was incapable of rushing to the bathroom when the urge gripped me. I never thought I would be wearing adult diapers post-mastectomy, but that is exactly where this whole fiasco landed me. As you can imagine all the discomfort and side effects from the narcotics made me eager to part ways. At my one-week post-mastectomy follow-up appointment I asked the question – Could I stop taking my narcotics? I had taken them religiously up until that point. I hadn’t even considered stopping until the lengths I had to go to end the constipation caused by the narcotics. I was told I could stop them at any time. That was the end of narcotics for good. Spoiler – I had four more surgeries after this, and I never again took the prescribed narcotics again. I replaced the narcotics with ibuprofen. I felt exactly the same on ibuprofen as I did on narcotics. I was in a lot of pain regardless. For me dealing with the pain far outweighed the hassle and discomfort caused by the narcotics. I did not feel the narcotics provided any more relief than the ibuprofen. Typically, I struggle with nausea post-anesthesia. The scopolamine patch the anesthesiologist gave me helped, but I eventually had to remove it. I was prescribed a medication for nausea that dissolved on the tongue. Post-mastectomy I also experienced dry mouth. The dry mouth prevented the dissolving of my anti-nausea medication. Ironically, the non-dissolving anti-nausea pill made me throw up. 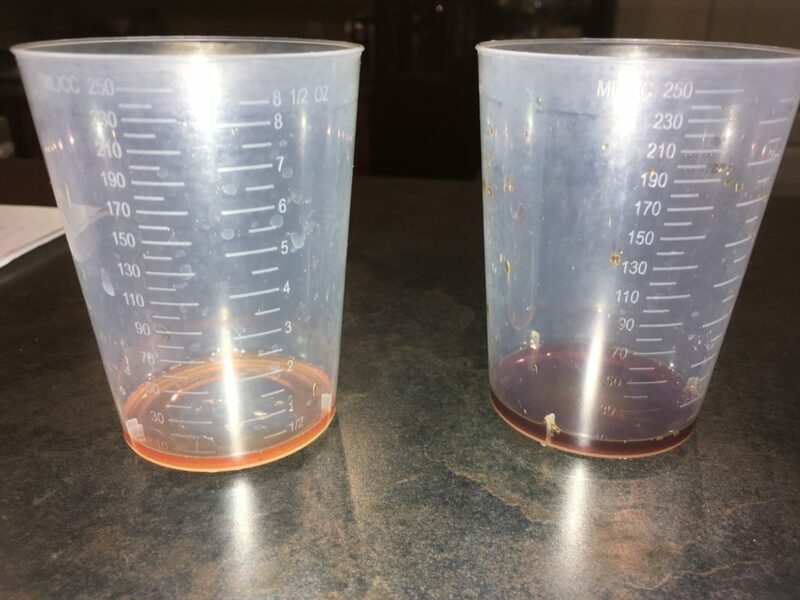 We were able to remedy this with a different medication that could be swallowed, and my dry mouth eventually subsided as well. Then there were the drains…my drains had to be emptied, the contents measured and tracked. Another spreadsheet. My husband helped me do this thrice daily. Once they were emptied, we had to reattach them and put them back into the pockets of my special tank top. That may not sound that bad, but the drains were one of my least favorite parts. Imagine over a feet of tubing protruding from your body and a container at the end that filled with bloody fluids. If you caught a tube on something or didn’t have a tight grip on the tube before pinching it with an alcohol swab and rubbing your fingers down the tube to drain it, you would feel an immediate sharp pain from the tubing being pulled. It was painful and despite my (& our) best efforts to be careful, it happened at least once daily. Measuring the drainage from my drains. The drains had to remain in place until the drainage reached an acceptable amount. Every day, I anticipated an acceptable amount. One measurement would acceptable, only to spike later. I was so eager to be done with drains, but it was an up & down waiting game. About once a day, when I felt up to it, we made the trek up the stairs. 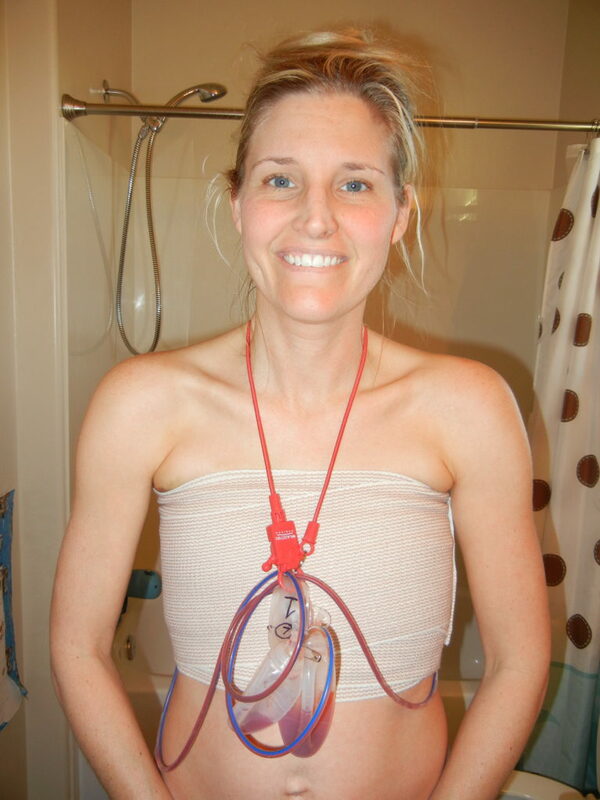 My husband helped me removed my bandages, while I held my drains. Then we carefully attached my drains to a lanyard around my neck. Technically my post-surgery directions specified no showers. However, after speaking with my surgeon I was told I could cheat a little if I had a handheld shower head and help. I was ok to shower as long as I kept my incisions dry and only showered from the waist down. Getting ready for a shower (you can see how bloated my stomach was here too). So I would stand in the shower while my husband held the shower head for me outside the shower. That enabled me to carefully wash and be mindful of my drains and incisions. Then he would help me dry off, wrap me in clean bandages and get dressed. I was pretty helpless by myself. Every 3 or 4 days, my husband drove me to a hair salon to have my hair washed, dried and styled. That may sound fancy, but it was not. It was a production and my husband had to help me into and out of the chair to get my hair washed. 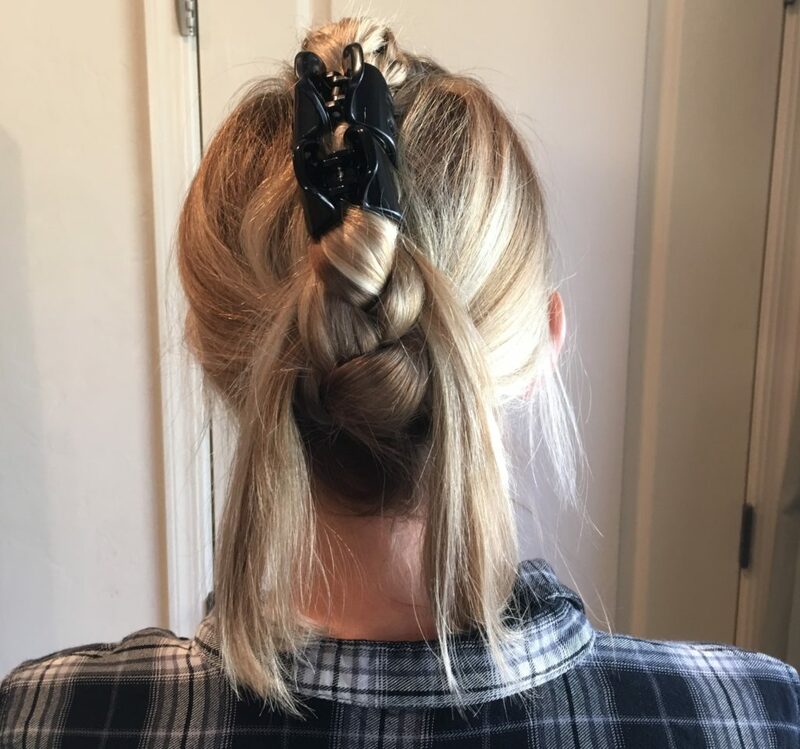 Since I could not reach my arms up nor get my incisions wet, I was not able to do my hair myself. Getting my hair styled meant having them put my hair completely up in some fashion where it would remain until I could get it washed and styled again. Some of these styles were comical. Getting my hair washed and brushed was a huge treat that really helped me feel less dirty and some level of normalcy. Yeah, a “professional” actually did this. Maybe she was confused by my messy up-do.